Marinate the prawns with 1/2 tbsp red chilli powder, turmeric, 3tbsp vinegar (or lemon juice) and salt for 30 minutes. Shallow fry the marinated prawns until cooked. Drain the excess oil and keep aside. Heat oil in a pan, add asafoetida, mustard, fenugreek, black pepper and curry leaves to temper the oil. Add the sliced ginger and garlic, green chili, and remaining chili powder and sauté until golden brown. 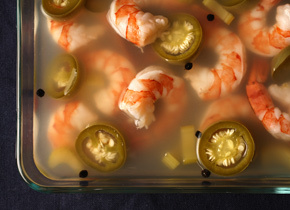 Add the prawns, remaining vinegar and salt (it should taste slightly saltier than normal) and mix thoroughly. Add more heated oil, just sufficient to make sure all pieces of prawn are covered with the vinaigrette.